A quick reminder as we head back to school and everyone comes back to church after summer vacation, that parking is at a premium. Here are a few reminders to consider as you come to church on Sunday. Plan Ahead: Give yourself extra time to get to church. Street Parking: You can park on the streets. Check out the parking map for available parking. Note the red areas are where NOT to park, and the green areas are fine to park. We do ask that you do NOT park in the housing complex across from the church on Catamaran, on Windjammer Circle and the Mormon Church Parking lot. (those are all highlighted in red on the map) Remember not to block peoples driveways with your car. It’s a good way to get your car towed. Walk or Ride Your Bike: If you live near the church you can help us by either walking or riding your bike on a Sunday. Carpool: If you have friends who go to CPC and live near you, ride to church together! You can even take an Uber or Lyft to church. We've updated our parking map to show you some new areas that are close to the church where you can park. A couple of things for those of you who park in the CPCFC parking lot. Please park with the nose of your car in, backing your car into a spot causes back up onto the surrounding streets. Also, watch your speed through the parking lot. We've seen a lot of people speeding through the parking lot. With children, adults and our parking team walking through the parking lot, we need to be careful of our speed. This week we want you to know the parking lot will switch to one way in and one way out. You will be able to enter the parking lot at the Catamaran entrance and we will have everyone exit onto Shell Blvd. This will help with the flow of traffic. Also note that you can get to CPC from Foster City Blvd. Take Foster City Blvd. into Foster City, make a right on Marlin and a right on Catamaran. You will find some great street parking or you can venture to the CPC parking lot. We want to remind you if you live in the area, join the CPC Scooter Gang, the CPC Biker Gang or the CPC Walkers to help free up parking spots. If you live outside of Foster City, find someone you can carpool with or take an Uber or Lyft. Most importantly, we are all in this together, so let’s have a great attitude as we work together to make parking as easy as possible. Would you be willing to be a part of our parking solution? If you are willing to serve sign up here or email Darcie Galvan. As you may know, we no longer rent space at Charter Square Shopping Center across from the Foster City Campus. A new elementary school is going to be built where the current shopping center now sits. This impacts CPC Foster City in many ways, but it especially impacts our parking. We can no longer park at the Charter Square Shopping Center. We were expecting this and have a team working on a parking plan. We will unfold the parking plan over the next few weeks and months. We know this is an inconvenience, especially to those of you who have faithfully parked at Charter through the years. So how can you help? For the immediate future you can help in several ways. Plan Ahead: Give yourself extra time to get to church expecting Charter Square to be fenced off. Street Parking: You can park on the streets. Check out this map for available parking. 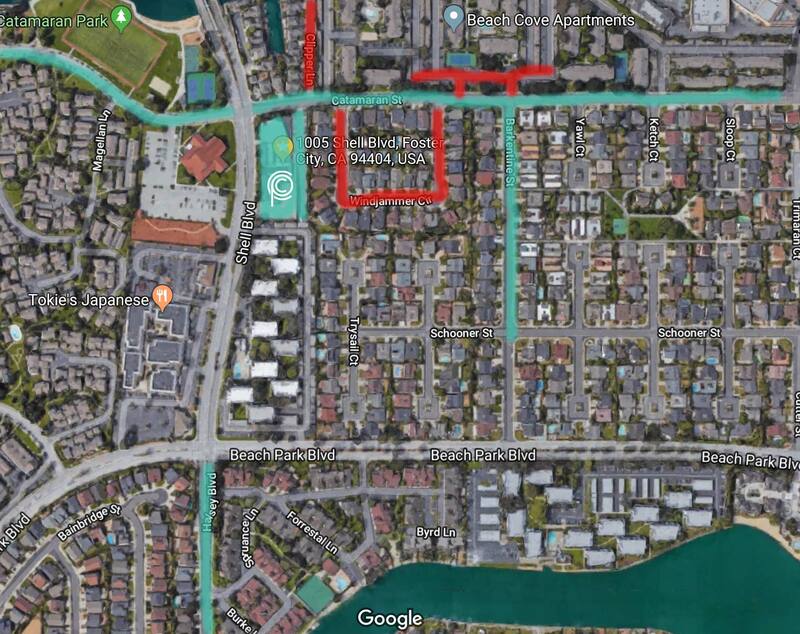 Note the red areas are where NOT to park, and the green areas are fine to park. We do ask that you do NOT park in the housing complex across from the church on Catamaran, on Windjammer Circle and the Mormon Church Parking lot. (those are all highlighted in red on the map) Remember not to block peoples driveways with your car. It’s a good way to get your car towed. TEXT: For up to the minute parking information text PARK to 43506. We will keep you informed of the latest details regarding parking at the Foster City Campus. The biggest way you can help is to serve. We need 25-30 people who are willing to serve on our parking team. We have a great leader who is passionate about parking but needs friendly men and women to serve alongside to help make parking at CPC as smooth as possible! Would you be willing to be a part of our parking solution? If you are willing to serve sign up here or email Darcie Galvan.